Training participants who registered for the behavior analyst and professional packages may take the examination for the Behavior Frontiers Applied Behavior Analysis (ABA) Training Program with an Autism Specialization - Part 1 after they have finished their training seminar or their online training. The examination consists of a total of 50, multiple-choice questions covering each content area from the training. The questions are designed to focus on examples, rather than definitions, and a sample question can be found below. What is the possible function of the problem behavior in the following scenario: Mother says, "Pick up toys." Student says, "No, I don't want to." Mother picks up toys for the student. You're right if you answered, D. Escape. 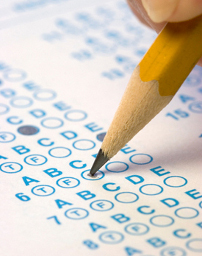 This is a timed examination, and participants have 1-hour to complete the questions once the examination begins. Participants pass the examination if they receive a score of 80% or higher. Those who do not pass the examination must wait 24-hours before they may re-take the examination. Eligible participants should enter their Access Code or login to take exam. Access Code holders enter code below.